Fitted or soft. Cashmere or combed wool. Turtleneck is a practical and chic pull, warm and snug. Perfect to wear when It's cold outside. An evergreen of every woman's wardrobe. 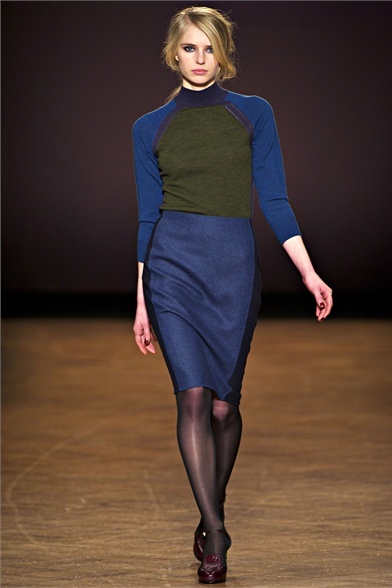 Turtleneck sweater and optical (illusion) skirt Mila Schon. Bicolor shirt with Knee-lenght skirt Paul Smith Women. 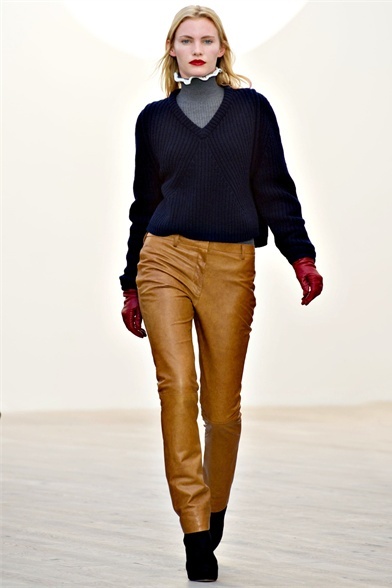 Turtleneck + V-neck pullover, leather pants and gloves Pringle of Scotland. Total black with satin piping pants Maison Martin Margiela. Micro pull on pencil skirt Dsquared2. Mesh insert sweatshirt and oversized trousers Sportmax. Baby-blue jumper on black skirt Balenciaga. Cable-knit sweater and plissé mini Les Copains. Pullover with pleated skirt Edun. Fitted o morbido. In cachemire o lana pettinata. Colorato o neutro. Il dolcevita è un pull pratico e chic, caldo e avvolgente. Un evergreen del guardaroba di ogni donna. Perfetto da indossare quando fuori fa freddo. Lupetto e gonna effetto optical Mila Schon. Maglia bicolor su gonna al ginocchio Paul Smith Women. 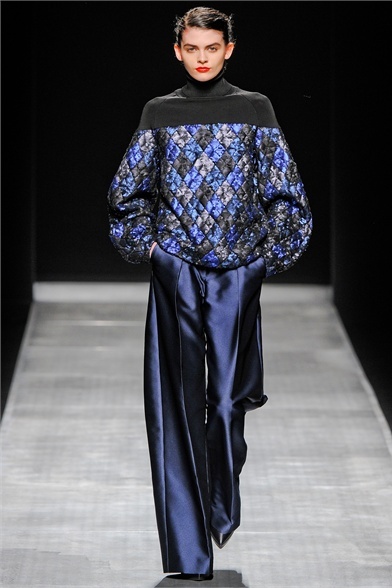 Dolcevita + pullover con scollo a V, completano il look pantaloni e guanti in pelle Pringle of Scotland. 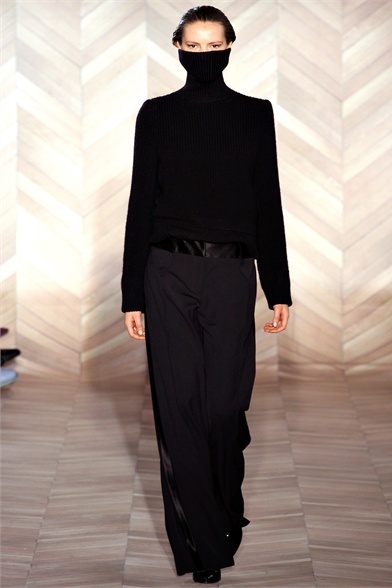 Total black con pantalone dai profili in raso Maison Martin Margiela. Micro pull su pencil skirt Dsquared2. Felpa con inserti in maglia e pantaloni oversize Sportmax. Maglia celeste su gonna black Balenciaga. Maglia a trecce su mini plissé Les Copains. Pullover e gonna a pieghe Edun. 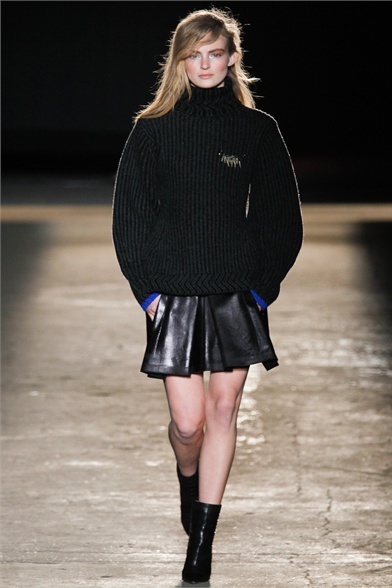 love the looks with the turtleneck knits - so classically chic! Overhere in SA, we call it polo necks for some reason, lol...think they're great for winter and I like how the designers here have made it look more elegant. The first and fifth looks are my fav! Your posts are always very inspiring. Great pictures! LOve love love the delicate paired with the big and bulky! The gun metal, gray, and black colors are just what I drool over!! I like that simple style. Have a great weekend. That first photo is making me regret not buying the Derek Lam skirt I saw on sale at Barney's today!!! amazing looks!! so elegant:)) keep in touch dear:)) happy weekend! Follow me and I'll follow back for sure! Thank you for your visit...may your week ahead be filled with luck and happiness! Mi piace il primo look. E' un capo che adoro e, infischiandomene delle mode, l'ho sempre usato tantissimo e con piacere...finalmente è tornato di moda, peccato che a Roma il freddo fatica ad arrivare...ma non disperiamo...baci! Thanks so much for stopping by and for your style insight! Io non potrei farne a meno. A me piacciono molto indossati in contrasto minigonna, calze scure e tacchi alti!